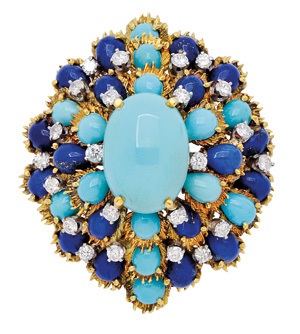 A turquoise, lapis lazuli, and diamond brooch. In her infinite wisdom with regard to our planet’s carbon-based existence, Mother Nature created only three primary colours: red, blue, and yellow. In endlessly imaginative permutations and combinations, these hues comprise the whole spectrum of colour available in everything our eyes behold, including the myriad world of gemstones. The rise and fall in popularity of any specific gem type is dictated not only by historical events and archeological excavations, but by what the latest fashion icons and both the famous and infamous are wearing. Availability of materials can also play a significant role. As in fashion, car finishes, and wall paints for the home, particular colours in jewellery become more or less prevalent and come and go with regularity, sometimes to be repeated decades later. It’s pretty natural and understandable if your customers are swayed by the prevailing trends, but remember it’s to your mutual advantage if they refine their collecting habits to include a variety of fabulous gemstones. After the death of her beloved consort Prince Albert, Queen Victoria followed the established practice of wearing mourning jewellery somberly decorated in black jet or gutta percha, a hard rubber material. Later, during the Art Deco period, the dark elegance of black figures prominently in designs as shown in the outlines of narrow bands of onyx that would literally delineate the geometric shapes of rings, bracelets, and brooch clips. These pieces continue to command healthy prices at auction whether or not they can be attributed to major houses, such as Cartier or Tiffany & Co.
Mined in Brazil or Africa, true black diamond-not to be confused with those funky, elongated, marquise-cut hematite stones that were all the rage in 1950’s costume jewellery-are being incorporated by current designers with their esteemed colourless or colourful diamond counterparts to create boldly dramatic pieces. Frequently pave-set and highlighted by intricately contrasting details, such items can be found in the secondary resale market at very reasonable prices, eventually finding their way to satisfied clients who can appreciate the novelty of their noirish shade. Elaborate Bohemian red garnet suites and multi-piece parures suited the gowns of ladies attending extravagant and opulent balls around the turn of previous century. 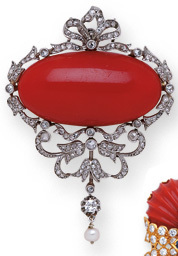 Red traditionally signifies love and passion and the cabochon cut dominated many designs of the day. Demantoid garnets were discovered in the Ural mountains, and their citrusy lime-green cast was imbued with the cachet of the ultra-sophisticated and well-connected royal families of Europe, who enjoyed sporting brooches, necklaces, and rings set with these cheerful, bright stones. 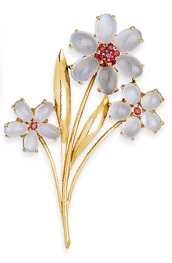 A floral moonstone and ruby brooch by Tiffany & Co., circa 1950. An Edwardian coral, pearl, and diamond brooch, circa 1900. A coral, emerald, turquoise and diamond brooch by David Webb. Garnet jewels of any shade, many of which were passed down through aristocratic families, can easily complement current fashions in pastel or jewel tones, and they are often available through major auction houses. During the 1870s, technical advances and innovations in indoor lighting caused by switching from gaslight and candlelight to electric bulbs showcased the clear, prism-like beauty of colourless diamonds. Elaborate chandelier pendant earrings complemented tiaras and necklaces in the festoon and garland style. The desire for the cool, icy look of rock crystal, either frosted or clear, spanned the Victorian era through to Art Deco, and refreshingly resurfaces in the Retro period (1935 to the late ’40s). Colourless diamond engagement rings are still overwhelmingly popular in North America, and discerning modern brides are beginning to appreciate the subtle beauty of many of the earlier cuts, such as old mine, cushion, and Asscher. A carved ruby, sapphire, and emerald ‘tutti frutti’ bracelet, circa 1930. Usually cut en cabochon or fashioned into beads, exotic stones like Persian turquoise or the vibrant blues of lapis lazuli are reminiscent of the tints in the painting palettes of Dutch master Johannes Vermeer. From the palest angelskin to the boldest peachy-pink, coral in all its shadings is a cosmetic colour and universally flattering to all skin tones. The renewal of interest in jade coincided with the establishing of trade and political relations between the west and China and Japan during the 1850s. Poetically named for the orb in the night sky, moonstones hover between the palest of watery blues and foamy whites. Edwardian opals, the solid rainbows of the gem world, what with their dancing play of colour, decorated fringe necklaces. June Cleaver personified the purity of pearls in the 1950s and early 1960s and now the Mad Men craze on television revisits their hidden sensuality. Think Jackie Kennedy or Audrey Hepburn in an iconic pose. Rubies, emeralds, blue sapphires, and other coloured gems have enjoyed universal crossover appeal through all the recorded eras in ornamentation. Those paradoxical and sentimental Victorians were fond of acrostic brooches and rings set with specific gems-put together the first letter of each and romantically spell a message or term of endearment. For example, a ring or brooch set with a ruby, an emerald, a garnet, an amethyst, another ruby, and a diamond indicates the ‚Äúregard‚Äù the giver has for the recipient. Carved gemstones in the ‘tutti frutti’ design, a veritable fruit salad of charm and whimsy for brooches and bracelets, hit their apex in the 1960s in the effervescent co-mingling of cheerful colour. In Europe, a groom tends to present coloured stones to his intended spouse, as evidenced by Lady Diana Spencer’s sapphire engagement ring. The publicity surrounding Diana’s choice contributed to the trend that has become more and more noticeable in North America. Your customers can be encouraged to emulate royalty by choosing an enticing antique emerald a la Princess Mary’s and Wallis Simpson’s in the 1930s, or the late Queen Mother’s sapphire bauble from the 1920s. In the last decade, Hollywood stars like Jennifer Lopez sparked the timely resurgence toward fancy-coloured diamond engagement rings. The ancient sages used to believe each type and colour of gemstone was imbued with special properties inherent within. Some brought good luck and wealth, or better health or fertility, or were useful for warding off the evil eye, etc. Over time, superstition gave way to a higher esthetic sensibility, generalized by an appreciation for the gemstone’s intrinsic beauty.